Aqua Tech Water Specialties is proud to be the number one provider and servicer of Geothermal Wells on the DelMarVa Peninsula! We have a vast knowledge in the design, build, and implementation process of Open Loop and Closed Loop Geothermal Wells. Geothermal systems offer a ridiculous “payback” margin post-installation. Geothermal systems have a 400% efficiency rating compared to a 94% efficiency rating found in most gas furnaces. In most cases your power bills will drop up to 70%!!! 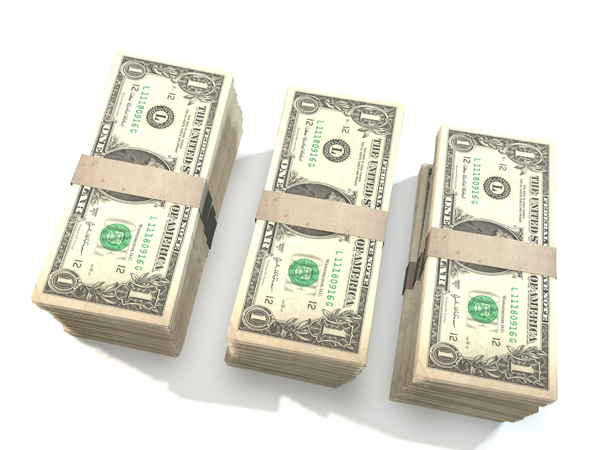 The Tax Credit may be claimed for spending on “Qualified Geothermal Heat Pump Property” installed in connection with a new or existing dwelling unit located in the United States and used as a residence by the taxpayer. Aqua Tech Water Specialties is proud to be the number one provider and servicer of Geothermal Wells on the DelMarVa Peninsula! We have a vast knowledge in the design, build, and implementation process of Open Loop and Closed Loop Geothermal Wells. Did you know that with Geothermal Systems you can actually heat and cool your home with dirt, not oil? That’s right, you can! Geothermal Systems use the dirt beneath your home (which stays at a constant 55 degrees year round) to heat up and cool down your home which is 4 times as efficient, costs less to operate, and can be one of the smartest investments you can make as a homeowner. 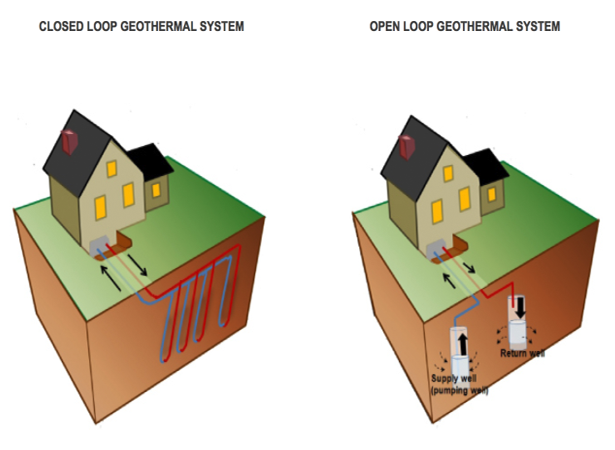 Geothermal heating and cooling systems can be divided into two broad classes: open-loop systems and closed-loop systems. An open-loop system withdraws ground water from a well, passes it through a heat exchange system, and discharges the temperature-altered water either back to the ground via a return well or to surface water. A closed-loop system circulates a heat transfer fluid (usually water with an antifreeze additive) through a loop or multiple loops of piping installed below ground or within a surface water body. A closed-loop system does not involve the withdrawal of ground water. Geothermal systems use the thermal energy stored in the upper portion of the Earth’s crust to heat or cool a building, replacing conventional heating and air-conditioning systems. The heat 20 or 30 feet down in the ground stays at a constant 50-60 degrees (usually 55) year round. Geothermal harnesses that energy residing in the earth to pull water from a well and run it through a series of loops which in return either heats or cools your home, as shown in the picture above. Why is Geothermal better than tradition oil systems? Geothermal systems use the dirt to actually heat or cool your home! Which also means no more oil, which means more environmental friendliness. The great thing about Aquatech Water Specialties Geothermal Systems is they can actually perform up to 400% better than traditional heating and cooling methods. This means less energy used which results in more money saved in the long run. Are all Geothermal Systems the same? No, all Geothermal Systems are not the same. Every installer has a different way of designing and implementing there system. Lucky for you though, Aquatech Water Specialties is the pioneers for Geothermal Systems on the DelMarVa Peninsula. We’ll design you a system thats guaranteed to perform and last a lifetime! Whether you are a new homeowner or an existing homeowner Geothermal is always a good choice to look into! It is always recommended that you go with geothermal for new homes as it is easy to come in and drill all the necessary holes and do all necessary hookups before the home is built or and landscaping is laid, this minimizes cleanup and leaves virtually no presence that we were even there! If you are an existing homeowner it is still recommended that you go with Geothermal but there are some precautionary steps that have to be taken. A representative from Aquatech Water Specialties will come out, for free, and inspect your property to determine if Geothermal is right for your home. Sometimes restrictions such as property size, home size, or home location prevent us from drilling the system. But 9 times out of 10 there is no difficulty getting you a new Geothermal System installed in your home! Sounds great! Where do I get more information? If your ready to start your venture into the Geothermal world for your new home and/or business or if you just have more questions please request more information and we’ll be sure to get back to you as soon as possible! Geothermal systems offer a ridiculous “payback” margin post-installation. After your system is installed you’ll immediately start to notice declining electricity bills. Thats because Geothermal systems have a 400% efficiency rating compared to a 94% efficiency rating found in most gas furnaces. In most cases your power bills will drop up to 70%!!! A lot of homeowners wonder what the “payback” period is for Geothermal installations. Well, to be honest, it varies by home and the area you live in. Thanks to the 30% Federal Tax Credit Break (good through 2016) for newly installed Geothermal Systems you’ll probably find your money back in your pocket in 3-8 years. Geothermal Systems are notoriously quiet. There are no more A/C or Heating units outside your home since it’s all underground and under your house. The sound of the Geothermal System running is comparable to the sound of a refrigerator running. Geothermal Systems will help you reduce your carbon footprint by up to 50% along with also being recognized as the most environmental friendly way to heat and cool a home. Since there is no heat pump, there is no chance of carbon monoxide poisoning. Geothermal also provides some of the cleanest air available for your home and, when paired with high efficiency air cleaners, will produce healthy air for you and your family to breathe for years to come. Geothermal units are good for 15+ years while the pipes use to make the “loops” of the geothermal systems are good for 50+ years. “Qualified Geothermal Heat Pump Property” means: Uses the ground or ground water as a thermal energy source to heat the dwelling unit or as a thermal energy sink to cool the dwelling unit, and meets the requirements of the Energy Star program which are in effect at the time the equipment is installed. Labor costs associated with the installation of the geothermal heat pump property and any associated materials (piping, wiring, ducts, etc) are included. The residence does not have to be the primary residence. The tax credit can be used to offset both regular income taxes and alternative minimum taxes. If the tax credit exceeds the income tax liability, the remaining balance can be carried forward into future years. We want to make sure you’re getting the best assistance possible when choosing whether or not to go with a Geothermal System. To help assist our customers and the general public even more, we’re happy to provide free consultations and quoting to determine your best option. Please fill out the form and we’ll get in touch with you as soon as possible. If it’s before 5pm on a weekday, you can also call us at (302) 684-5045!